A bomb named Trinity exploded at 5:29 am on July 16, 1945, in a region of central New Mexico known as La Jornada del Muerto: the Journey of Death. Violence was destined for this stretch of the desert, and such inevitability was not lost on J. Robert Oppenheimer. A rather literary warrior, Oppenheimer wrote poetry at Harvard years before he directed the Manhattan Project. One poem, “Crossing,” likely depicts “ranges barring the sky” near the Norman Bridge Laboratory in California, where Oppenheimer did physics research. The poem’s setting is indistinguishable from Santa Fe, where he led the development of Trinity, as well as the bombs that would later destroy Hiroshima and Nagasaki. Oppenheimer claimed the name Trinity came from John Donne’s representation of the “three person’d God,” though biographer Ray Monk thinks the physicist is being “characteristically evasive.” If the bomb delivered a snippet of God’s wrath, it was a merciless God. 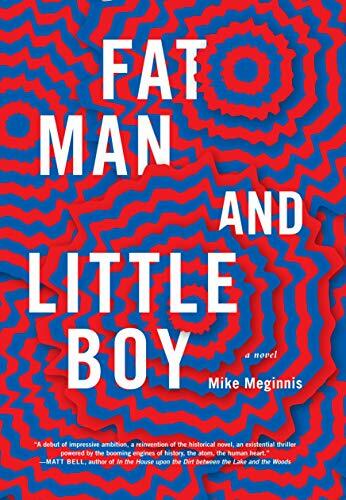 Fat Man and Little Boy, the unique debut novel by Mike Meginnis, is a noteworthy contribution to the literary aftermath of these bombs. Meginnis’s style is perfectly suited to his subject, though that style has a curious antecedent in the prose of poet Dylan Thomas. “The Tree,” a story tucked into Adventures in the Skin Trade, is a surreal fable about a boy who nails a traveling beggar to a tree. Thomas’s prose whispers the violence. The boy is whipped into frenzy by his family’s zealot gardener, who “would sit in his shed and read of the crucifixion, looking over the jars on his window-shelf into the winter nights.” Thomas takes soft steps as he reaches the story’s conclusion, when “blood from the cuts fell shining on to the tree.” His one-sentence paragraphs are not breathless but heavy, and the boy’s perversion of the Passion narrative results in an uneven ending, as if the story was too raw to be edged. Meginnis’s prose commands a similar power, even during its moments of declarative simplicity. Fat Man and Little Boy is what it would sound like if Dylan Thomas wrote about the atomic bomb. After the novel’s short, imagistic prelude, the bombs dropped on Japan — Fat Man and Little Boy — become human. Fat Man opens his eyes inside a bunker, surrounded by destruction. He sobs “without apparent cause, or with causes too trivial for words: the way his walrus shadow climbs the wall so that his head looms on the ceiling like an astral body.” He is whole in body, but only a child in narrative age. He “remembers how it was to explode.” Little Boy, “gawky and thin,” whose “bones all protrude from his limbs like knobs on a young tree,” calls his larger friend “brother.” Their life together begins in kindness. Little Boy asks if he can walk by Fat Man’s side, and hold his hand, and speak to him. But Fat Man looks around to see the destruction they wrought. Meginnis’s talent is his ability to make the reader feel empathy for souls who killed so many. Many pages in this novel feel like engravings, and those meticulous emblems carry the novel through uneven moments, as when the story strays from its folkloric center. The novel’s second act brings the brothers to France, and the trip first sounds like a joke, but the punchline is real. Their misadventures increase their dramatic humanity, but the book’s profluence slows until Meginnis carries the brothers to Hollywood. Fat Man has married Rosie, the owner of a hotel in France, and they have a daughter, Maggie. Fat Man is being chased by more than one character who wants revenge for the atomic blasts, but the family attempts as much normalcy as anthropomorphic weapons of mass destruction can manage. They come across a restaurant called “Atomic Burger,” and Fat Man hesitates, thinking “it’s in pretty bad taste” to eat there. The scene is hilarious enough to make one cringe, and signals Meginnis’s return to narrative control. The novel’s final quarter shifts between suspense and transcendence. During the novel’s dramatic end, the family escapes to see a movie: “Seeing a movie in Hollywood is like going to church. Everyone dresses up. The ushers guide you to a place where you’ll feel welcome or at least out of the way. The room swells with talk until the show starts, and then everybody shuts up. The audience’s eyes swell with hope and need while the music blares and then, when the talking starts, they settle in. This one will be like the others. But you’ve got to respect it. The ritual of the movie is more important than the movie.” Meginnis has said that the novel had its origins in filmic representations of the explosions, how the cloud crawled wider and wider, changing the land forever. Meginnis has written one of the best, most natural novels about the atomic bombs. Dennis Bock’s 2001 novel, The Ash Garden, also examined the intersection between American and Japanese lives in the decades after the blasts. Bock’s novel, though beautifully written, feels more orchestrated and less organic in comparison. Literature often seeks to intellectualize methods of war, and to craft fictional revisions of conflict that offer transcendent theses. In making the bombs human, Meginnis switches the expected fictional order; he leads with idea, and then steps aside. Fat Man and Little Boy earns its clever conceit, and carries its greatest power when localized to settings that felt the heat of these bombs. The novel begins in a broken Japan and ends in a fabulist Hollywood, where destruction often gets a second take. Fat Man and Little Boy is a second take on the legacy of American bombs. Despite the novel’s experimentation, it is ultimately more fact than fiction. Nick, great review – sounds intriguing. For anyone wanting the real ‘inside’ story on the development of the Man and Boy bombs, I would highly recommend ‘Hiroshima Nagasaki’ by Paul Ham (see WSJ review: http://online.wsj.com/articles/book-review-hiroshima-nagasaki-by-paul-ham-1407283442). Ham writes with great precision yet with fluidity about the forces that came together to make The Bomb(s) happen. Ham gained access to a lot of recently declassified documents showing the internal fights and the broader war context of what was happening New Mexico, Washington and Japan. Would make an interesting companion to ‘Fat Man and Little Boy’.